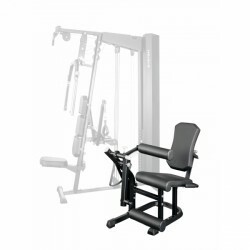 The module 2 of the Kinetic multi-gym is the Kettler leg extension/leg curl Kinetic. This add-on module is mounted on the side of the Kettler basic station Kinetic and is connected with the 100kg weight block via a cable pull. The variable leg extension/leg curl allows an effective and varied leg workout. The easy-to-adjust eccentric technology and the movement limiter are also easy to use for beginners and protect from injuries.